Harriet captured me on the first page and Julianna’s unfurling of Harriet’s story along with those of her daughter, Eleanor, and her daughters, Ruthie and Tilton, are told with unique voices, divine details and characters that border on the magical. Harriet is a writer whose six previous “Wonder” novels have drawn legions of fans, and rumors that a seventh novel exists persist even long after Harriet’s death. Readers are anxious for yet one more story from Harriet. But Harriet tells her story, in first person, to her daughter and granddaughters and you, the fortunate reader. Along the way you’ll meet Harriet’s lov,e Eppitt, a villain, a mobster and a lion that rides in a motorcycle sidecar. This is a story will capture your imagine and your heart. Q -- At the risk of sounding like one of Harriet Wolf’s fans, I must tell you that it has been years since I’ve cried while reading a book. The love stories in this novel are filled with such intense loss. Even the mother and child love stories are shrouded in grief. And despite the suffering by all characters, the novel remains hopeful. Could you discuss how you found that balance between the deep emotional tug of this story without it becoming mawkish. A -- I’ll risk too much emotion, mawkishness, sentimentality, nostalgia. I’ll risk all of it because I’m not interested in the stinginess of the novelists who don’t risk it at all, who fail for a lack of emotion, for stoicism in hopes of creating something more, what? Restrained? Don’t get me wrong. I’m not talking about the characters. I love the richness of a well-rendered emotionally bottled character. I’m talking about the writer. Life doesn’t feel very restrained in its manhandling of us so I won’t be restrained in my depiction of it. Q -- I understand it took you eighteen years to write this novel but you obviously produced other works during that time. Were there extended periods that you left Harriet, Eleanor, Ruth and Tilton alone? And what was your process for turning to their stories? A -- Yes. There were long stretches when I didn’t work on the book. But there were also vastly different versions that I abandoned. At one point, Eppitt was the main character. I went pretty far along with that draft. When I found Tilton, in this form – there’s an earlier screenplay version where she’s male – this draft took shape and I dug in and didn’t let up. Q -- Your novel covers basically the entire 20th century. In that span of time, language changed, social norms altered, technology advanced and yet the story takes the reader seamlessly from era to another. What sort of research did you do to create the voices of Harriet and the others? And how did you make sure the language would remain engaging to the reader, but also true to the time period? A -- Harriet’s sweeping timeline required a lot of research, which I love. Much of it I did pre-internet or pre-what we now think of as the internet; it was that long ago. I went to what was once The Maryland School for Feeble Minded Children and walked the grounds, as Harriet did with one of my kids in tow. I interviewed a couple who witnessed the plane crash over Elkton, Maryland when pregnant with my son who’s now eighteen. So, yes. A lot of research. But language is about getting into character, much like an actor’s work. Once you drop in, you’re in. There’s no confusing Harriet for Eleanor, for me. Q -- Tilton has a magical, almost fairy-like quality about her. As a reader I ached for her. She appears to have been sealed in childhood, even though her story is told from the perspective of a twenty-one-year-old. How did Tilton come to be? A -- Tilton comes from me – not in the particulars but in some emotional way. I was the youngest, left by my older siblings, and overprotected by my mother. I see the world in poetic terms – though not to the extent that Tilton does, and of course, I’m nothing like her, having made my own life. Still, my world can seem very small and yet also lush in its small details. Q -- The Maryland School for Feeble Minded Children is pivotal to the story. In Chapter Four, Harriet writes, “But now the task at hand. How to make real the Maryland School for Feeble Minded Children itself? The galling notion of it might be so outdated that no one can believe it ever existed. You might think I’m being fictitious. Fair enough.” What was your process for making this outdated place come alive? A -- As I mentioned, I visited and, while there, photocopied the 1911 report. That gave me many details to work with and helped me recreate that way of growing up. Q -- Willa Cather spoke to her characters each day. Cather said that while she was writing “The Song of the Lark,” she felt as if Thea was always on her shoulder. Did you carry on conversations with Harriet and Eppitt and all the others? And now that the novel is published, do you miss the interactions with the world you created? A -- By the time a book actually comes out, my attachments are with new characters, which is actually a good protective device. I have to go public, allow them to be criticized, which isn’t their fault, but how I’ve failed them. It’s not easy, but hardest if you’re still with them. I try to divorce myself as early as I can. Tough to do sometimes. Q -- Did you worry that the back and forth of the novel in time and place and character would be confusing to the reader, and that the foreshadowing of events and details might be lost? For instance, the reader knows that Harriet gave up public appearances early in her writing career, yet the reader doesn’t understand why that detail mattered until the second to last chapter. My relationship isn’t with the individual reader. That’s too complicated. Some readers hold all details, see everything coming, and others are easily confused and caught off-guard by twists. My relationship is only with one reader per book. If I’m true to that reader – imagined or real – I’ve done my work. That said, I was very worried that four first-person narratives were going to overwhelm and confuse the reader – which “I” is speaking now? The italics of Harriet’s sections and the very different way of speaking used by Tilton make them distinctive enough. I worried about Eleanor and Ruthie then and went back into the early pages of each, putting in little phrases and ways of speaking that were their own. Q -- Harriet and Eppitt’s love story is haunting and beautiful and sad. The reader knows this will be the case on page five. “You can’t have love without knowing sorrow; you can’t have miracles without desperation.” How did the story of Harriet and Eppitt develop? Was there a time when you tried to write their story with a happier conclusion or did you know from the start that their love story would be tragic and filled with missed opportunities? Q -- Pacts between the characters are vital to this novel. What is it about this idea of creating pacts that so intrigued you? A -- Maybe it’s kind of Catholic of me. I’m not sure, but I love a good vow. We’d taken our four kids and our niece to Ireland. It seemed important that they make a pact to return one day – the five of them, plus as many other cousins as possible. So they all signed a pact. I like those kinds of things. Q -- Eleanor is one tough woman. The idea of a mother telling her children a bedtime story each night that involves a plane crash and dismembered limbs is bizarre, and funny. As a reader I never left the fictive dream. How did you strike that balance of developing memorable characters that are believable? A -- My mother told me very vivid and disturbing family stories when I was little. She was bored – the older kids had grown up and left the nest – and she’d keep me home to play cards and do some banking. And she’d hand down the family lore – dark twisted Southern gothic stuff. Most of it I’ve never written about. (Some of it is in THE MADAM, based on the life of my grandmother raised in a house of prostitution.) 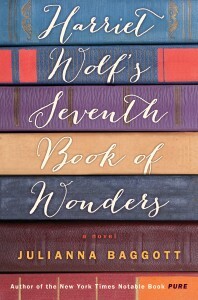 But the idea of stories – how a family can be defined by its own sacred mythology – is thematically central to HARRIET WOLF’S SEVENTH BOOK OF WONDERS, and it’s something that I believe in, that stories are transformative. This belief sustains me as a writer. Buy the book through an independent bookstore. Julianna Baggott reading at PEN/Faulkner in Washington, DC. Sara Kuhl is a recent fiction graduate from the Converse College low-residency MFA program. (A program she highly recommends for its brilliant faculty and excellent students.) Her personal goal is to introduce Willa Cather into as many literary discussions as possible. By day, she serves as the director of University Marketing and Media Relations at the University of Wisconsin-Whitewater.